Martinis for the Fourth of July - Independence Day Martinis! 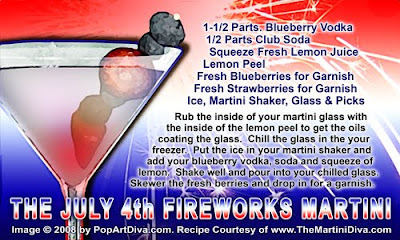 Here's a fun martini for your Fourth of July party - The July 4th Fireworks Martini. This is a fun blueberry martini that is simply blueberry infused vodka with a bit of lemon juice and a splash of club soda - the real fun comes in the garnish of fresh blueberries and strawberries for that red, white and blue color theme!